Pitchers still "inflate" when thy get the tiny lid problem don't they? My ventricosa that I have been growing on a windowsill this year started off with almost no lid because of the low humidity, but it still inflated all the way. I hope this is relevant to the conversation. My N. ventricosa did the same thing earlier this year. I wouldn't call that "inflation," just normal growth. I don't think anyone is suggesting that the gas inside the pitcher is what's driving its growth and expansion; inflation is a colloquial term. It's just obvious that the pitcher is somewhat elastic and could possible contain a higher pressure atmosphere than ambient air. It's an interesting question which may have a null result. I'm fairly certain the pitcher is "sealed" before the lid opens. I can press on the sides of mine when it is near maturity, which increases the pressure. It can withstand quite a bit, but then the lid finally bursts open. 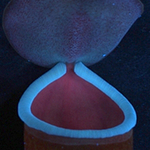 If I were to guess, I would say that the connection between pitcher and lid around the lip would be an example of programmed cell death, where the cells connecting the lid and pitcher die in order to allow the two parts to separate, much the way the webbing between human fingers disappears during development. a nature abscission layer perhaps? Similar to that located at the base of deciduous leave's petioles. it's not gas i don't believe, because one of my ventricosas lost part of the cap on a growing pitcher bud, and it still inflated to several inches. i think it is much more likely that the tissue just expands. as far as imploding, that would only happen if there was a vacum in the pitcher. and feel a pitcher, most are fairly rigid. they wouldn't implode from what little negative pressure goes on in there. and if it was gas, species with small lids, which are often some of the most bulbous species, are quite small, and would not create an efficient gas seal during inflation. Even though this is a thread about Nepenthes, I am surprised no one has mentioned or thought of Simillarities that might exist between Nep's and Sarracenia. I always wonder if sarracenia dont have a fair amount of pressurre within developing pitchers, it always amuses me when they look like they going to explode. There is an interesting 'gas composition' inside Nepenthes pitchers. We will provide evidences soon. Here is the Abstract of the study published in Scientific Reports today (September 12, 2017; Scientific Reports 7: 11281, 2017; DOI:10.1038/s41598-017-11414-7)). 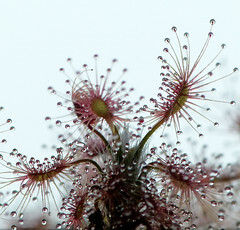 Carnivorous plants of the genus Nepenthes supplement their nutrient deficiency by capturing arthropods or by mutualistic interactions, through their leaf-evolved biological traps (pitchers). Though there are numerous studies on these traps, mostly on their prey capture mechanisms, the gas composition inside them remains unknown. Here we show that, Nepenthes unopened pitchers are CO2-enriched ‘cavities’, when open they emit CO2, and the CO2 gradient around open pitchers acts as a cue attracting preys towards them. CO2 contents in near mature, unopened Nepenthes pitchers were in the range 2500-5000 ppm. Gas collected from inside open N. khasiana pitchers showed CO2 at 476.75 ± 59.83 ppm. CO2-enriched air-streaming through N. khasiana pitchers (at 619.83 ± 4.53 ppm) attracted (captured) substantially higher number of aerial preys compared to air-streamed pitchers (CO2 at 412.76 ± 4.51 ppm). High levels of CO2 dissolved in acidic Nepenthes pitcher fluids were also detected. We demonstrate respiration as the source of elevated CO2 within Nepenthes pitchers. Most unique features of Nepenthes pitchers, viz., high growth rate, enhanced carbohydrate levels, declined protein levels, low photosynthetic capacity, high respiration rate and evolved stomata, are influenced by the CO2-enriched environment within them.